Yesterday, I posted this as my Facebook status: "Well, it looks like Geri and I have a house and will soon be moving 6 or 7 miles to the southeast. Busy, busy, busy...."
This whole year has been extremely busy, and feels like a blur with no end in sight. As I've said before, I published 10 books between January 1st and May 9th via Crisis Chronicles Press. There are three primary reasons for that rapid (and for me unprecedented) pace: 1) I was so behind (so far that 6 of those 10 had taken me over 3 years to publish) and being so far behind was becoming more and more unbearable to me. 2) I suspected I'd be doing a lot more seasonal day work during the spring, summer and fall, and didn't want to fall even further behind on press work when that time came, so I needed to get as much as I could done while I was still largely homebound. And 3) for once, for several months in a row no life crises came up to slow down my progress significantly. But by May I got a non-Press day job again, and then another, and other life priorities came up, and as expected, press work slowed to a crawl. I'm not complaining, just explaining. I know that by the end of fall my day job will slow down, other issues will be resolved and I will pick up the press pace again. Meanwhile, I hope to at least get a few new books out while it's still summer. Two forthcoming Crisis Chronicles Press titles, Ode to Horatio and Other Saviors by Carolyn Srygley-Moore and Inquiry into Loneliness by Meg Harris are THIS CLOSE to being published. Meanwhile I continue to "make hay while the sun shines" in every way possible. And then this new house business came up fairly quickly. While I was working, Geri kept looking for places. The stairs to our upstairs apartment have become too much for her. They're also becoming too much for our dog Lady, who was diagnosed with cancer this year. I didn't expect us to find and afford and be able to close the deal on a place so quickly. I thought maybe it wouldn't be till next year or later in the nebulous future. But before I knew it, we're here, and suddenly I have a lot of packing and other move-related things to do every free moment I get. I feel stressed (and not just because of all this), but also excited and very fortunate. We're picking up the keys to our new house this evening. I just need to keep going at a breakneck pace for the next month or few to get everything done. There are so many other pressing things that I'd like to talk about, but I can't right now. Maybe one day. But I've rambled on enough for one morning, and I need to DO more than I need to talk. 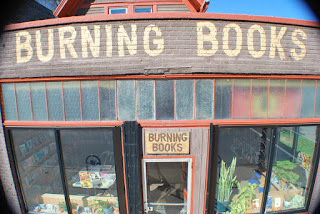 Hopefully, I'll have photos to share the next time I write. 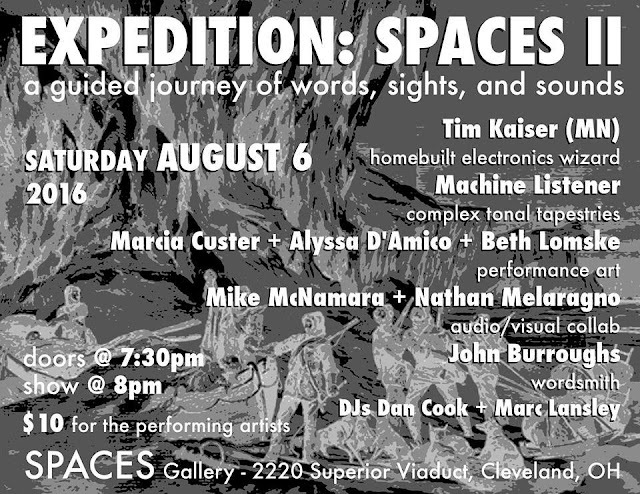 I just got this flyer for the Expedition: Spaces II event I posted about recently. Gonna be great fun! EXPEDITION: SPACES II: A Guided Journey of Words, Sights & Sounds! This guided expedition brings together artists from across the globe to explore the realms of experimental and electronic sound, live projections, and performance art. Featured performers include sound artist and inventor TIM KAISER, who is recognized nation-wide for his accomplishments as an avant garde instrument builder and performer. Writer and poet JOHN BURROUGHS will lead us from gallery to gallery with spoken word segues. MACHINE LISTENER will perform a set of complex tapestries of heady electronic sound. Performance art trio MARCIA CUSTER + ALYSSA D'AMICO + BETH LOMSKE will delight us with a set exploring the nature of friendship, fear, and the cyclical nature of leaving. MIKE MCNAMARA and NATHAN (GERONIMO) MELARAGNO will collaborate on a set of guitars, electronics, and found sounds paired with live analog liquid light projections. Underground vinyl DJs DAN COOK and MARC LANSLEY will open and close this Expedition, spinning an eclectic mix of minimal techno and electronica. 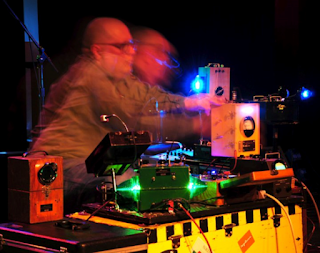 Tim Kaiser is well known in the homebuilt instrument and experimental music scenes nationwide for his blending of acousto-electric contraptions and Frankenstein electronics to create ethereal, layered drones. Experimental sonic and performance artists Marcia Custer, Alyssa D'Amico and Beth Lomske are friends first and collaborators second. Marcia and Beth of Half An Animal and Alyssa D'Amico of NRML GRL will collaborate on a new performance experiment "Are You Afraid of the Light" which explores the nature of friendship, fear, and the cyclical nature of leaving. The artists have individually performed at venues and galleries such as SPACES, Guide to Kulchur, Mahall's, and Pilgrim Church. All three participate in the SPACEBEACH integrated media performance art collective. Mike and Nathan will perform a collaboration set of music and liquid light projections. MIKE MCNAMARA is a guitarist and composer who has been active in NE Ohio and beyond since 1996. Mike has a wide performance repertoire and has performed solo at various venues, galleries, festivals and theaters in NE Ohio, as well as with Neil Chastain/Pureplex, Muamim Collective, LMNTL, and Kokolo Afrobeat Orchestra. He has also collaborated with movement and visual artists at multi-media special events like Ingenuity Fest and CPT's Pandemonium. Mike holds a BM in Classical Guitar from CSU and teaches privately and with the Cleveland Classical Guitar Society. For this evening's performance, Mike will be working with guitars and electronics and found sounds from the urban landscape to create an ambient, layered environment that explores stillness, austerity, and emotion. NATHAN MELARAGNO is a multi-media artist living and working in Cleveland, OH. His artistry spans from analog liquid light projection, to film photography, sound environments, and large scale painting. Nathan preserves psychedelic history through practicing, studying and teaching analog techniques in all fields of his creative focus. John Burroughs is a Cleve-based poet, playwright and musician whose books include The Eater of The Absurd, Barry Merry Baloney, and Water Works. He co-founded the annual Snoetry: A Winter Wordfest and performs solo and with random partners as Jesus Crisis Ban/ne/d. 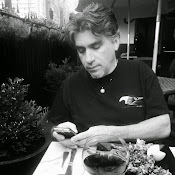 John has served as founding editor of Crisis Chronicles Press since 2008, publishing superb indie writers from around the world. John will be our guide for the event, responding to the evening's doings with poems improvised and/or memorized but never cauterized. DAN COOK is a techno DJ and producer from Cleveland, OH. He got his start DJing and throwing parties in 2010, culminating in the Solarity series of large format events at Oberlin College through 2013. More recently, Dan has been featured in Bent Crayon's monthly underground vinyl DJ series Hollow Earth and also runs a sound system in the area with sightings at local DIY venues and events. MARC LANSLEY is a producer and DJ based in Cleveland,OH and Cologne, Germany. Marc has had a passion for electronic music of all kinds since the 90s, a path which led to becoming one of Cologne's foremost underground DJs and a well-established entity to connoisseurs of the city's somewhat secretive nightlife. In 2006 he started drip-feeding his own material to unsuspecting crowds, leading to a debut release with longstanding partner in crime Falko Brocksieper on the iconic Sub-Static imprint, a small batch of rarefied leftfield edits and remixes for acts like Walls, Kasper Bjorke or Fraktus. This remixing lead to Marc teaming up with Okinawa 69's Shumi as DJ/production duo Truffle Shuffle - which in turn resulted in them co-founding their own label Low Hanging Fruit, distributed by Kompakt and sporting releases by artists like Camp Inc., Bryan Kessler, David Hasert and more. Having recently relocated to the US, he now scouts new battlegrounds for his personal brand of electronic mayhem in Cleveland, OH, the punk queen of the rust belt and as much a staple in the hidden history of alternative music as was his former hometown. – (adapted from Resident Advisor). 8 Years ago today I officially launched Crisis Chronicles Press by self-publishing my own tiny Bloggerel chapbook to hand out at readings. At the time I had no idea that this would evolve into a "real" press. It couldn't have happened without you. Thank you! Looking forward to my first trip to Buffalo! Wednesday, July 13, 2016 at 5:00 pm.